Software client ”Inmedafit” – FOP Shvachko V. V.
The software client that allows users to obtain the detailed information about the network and local media resources, process the Rhythmbox audio player’s database, create and manipulate by playlists. 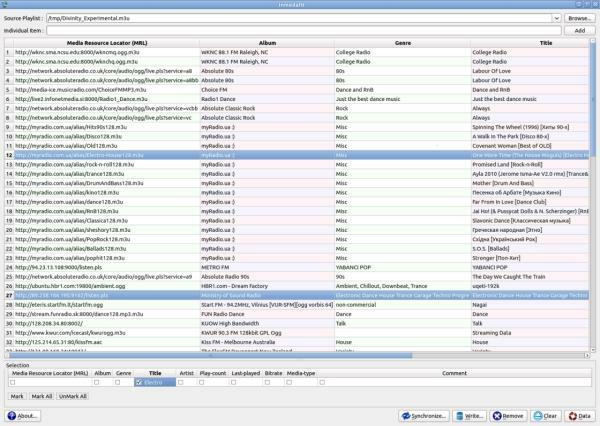 Screenshot of software client “Inmedafit”. – Writing the processed playlists in the standard pls- and m3u-formats (for future utilizing by the wide-used media players like VLC, Movie Player, Windows Media Player etc at various operating systems). Actual playlist of the known Internet radio stations which are located worldwide includes more than 1300 items and it increases permanently. Documentation of software client “Inmedafit”.